2007 U.S. 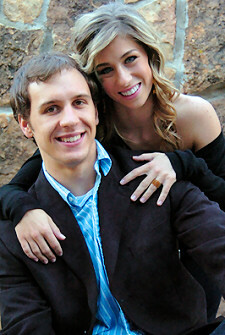 Pair champions Brooke Castile (21) and Benjamin Okolski (22) began their partnership following the 2002 U.S. National Championships. Tamara Moskvina once said that it takes four years for a pairs figure skating team to come together as one. If measured in terms of medals, it could be argued that Brooke Castile and Benjamin Okolski took an extra year to make that happen. However, in their fifth year it was apparent that this team was something special. Skating in only their third senior national event, Castile and Okolski came away with the 2007 U.S. National pairs title with haunting performances that wowed many who watched the event and even toppled heavy favorites Rena Inoue and John Baldwin, Jr.
Castile (21) and Okolski (22) began their partnership following the 2002 U.S. National Championships in Los Angeles, and entered their first competition later that summer. Okolski previously skated with his younger sister Colleen, but that partnership dissolved after a fifth place finish on the novice level in Los Angeles. Castile competed in novice singles at the 2001 Midwestern Sectionals finishing in what she felt was a disappointing eighth place. She began to lose faith in her skating, so when the opportunity to skate with Okolski came about, Castile went for it. Castile and Okolski had some success on the junior level during the 2003-04 season, winning a silver medal at the 2004 U.S. National Championships and a bronze at a Junior Grand Prix (JGP) event. For the 2004-05 season, the team competed as juniors internationally again and as seniors for the first time at national events. They garnered a bronze at one of their JGP events and finished seventh at the 2005 U.S. National Championships. This result earned them a trip to the Four Continents Championships as well as tickets to two events on the ISU Grand Prix of Figure Skating circuit for the 2005-06 season. Leading up to the 2006 U.S. National Championships, Castile and Okolski had hoped to improve upon their standing from the previous season, but found themselves one place lower at the end of the competition. Following the event, the team decided to make a coaching change – joining Johnny Johns and Marina Zueva at the Arctic Figure Skating Club in Canton, Mich.
For the first time in their careers, the skaters felt organized under their new coaching team and knew what was on the agenda from day to day. “Johnny mapped out where he wanted us to be at each point in the year,” explained Okolski. “And we worked very hard to get there.” The plan, according to Team Castile and Okolski, was to win nationals in two or three years. That milestone came a bit earlier than planned, and could also be attributed to the competitive environment at the rink. Castile, who started skating at age seven with her “Nana’s” encouragement, enjoys spending her free time with her family, which includes Ben. “Ben is like a brother to me. There is nobody else in this world like him, and I love that,” Castile lamented. “My family is everything to me. I would not be who I am today or have the success that I have had without them.” Castile has also been dating former US-turned Canadian ice dancer Kevin O’Keefe for more than four years. Okolski began skating at the age of 8 after his family relocated from California to Michigan. “My parents were looking for a winter sport to put my sister and I into,” shared Okolski. “I began skating pairs when I was 12 with my sister Colleen.” Outside of skating, Okolski has a passion for listening to music and playing sports. At press time, Castile and Okolski were assigned to make their season debut at the Nebelhorn Trophy in Germany but withdrew due to injury. Castile and Okolski are also scheduled to compete at Skate America later next month, as well as Trophee Eric Bompard Cachemire in November.